Sign up for our eNewsletter! Suggested planting rate: one per 1.5 ft/sq. 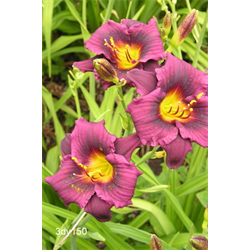 Notes: Grape Magic clumps are 3 year old field grown plants comparable to a 3 gallon container size.Use Grape Magic daylilies as a naturalizing plant, a groundcover, in formal sweeps, or as a focal point in the perennial border. Also, consider planting over and around spring-flowering bulbs to hide the bulb's foliage as it matures naturally, while adding late spring and summer color. Plants will be shipped at the proper time for planting in your USDA hardiness zone. If requested, we will accommodate specific ship dates when possible. * Bearded Iris, Crocus sativus, Eranthis, Galanthus and Lycoris orders will be shipped as soon as available in Fall. **Orders from colder zones received after shipping has begun will have priority as long as weather permits.